Incheon (South Korea) (AFP) - Japan's Yuya Kamoto took gold in the Asian Games men's individual all-round gymnastics on Tuesday as China again missed out on the medals. 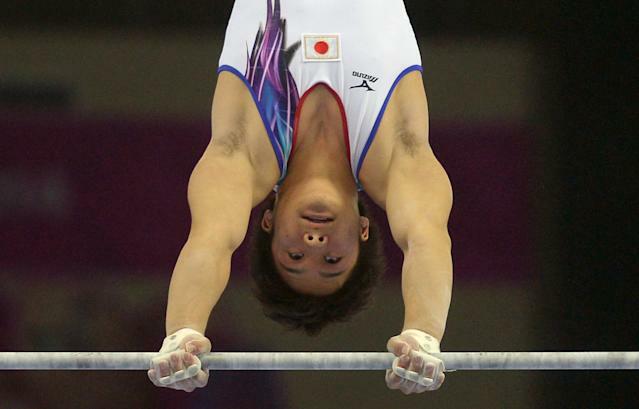 Kamoto, the 2010 Youth Olympics all-round gold medallist, beat Masayoshi Yamamoto into silver for an all-Japan one-two at Incheon's Namdong Gymnasium. After slumping to third in the team event on Sunday, powerhouses China were hoping to bounce back, but their duo had to settle for fourth and fifth as South Korea's Lee Sang-Wook took bronze. Kamoto finished top of the qualifying round and picked up where he left off, earning high marks for execution across the six disciplines, including two above 9.0. The 20-year-old said he felt relieved by the victory -- Japan's first in the event in 36 years. "Winning these events have been my goal ever since I was selected as a national team member, so I feel like a load has been lifted from my mind," he said. China's fourth-placed Huang Yuguo lamented letting himself be distracted by errors early in his round. "I didn’t feel comfortable when I was performing. I think it’s because of mistakes in pommel bars at the beginning," he said. There was better news for China in the women's event as Yao Jinnan took gold and Shang Chunsong silver with ease. After utterly dominating Monday's qualifying rounds, the Chinese duo continued their display of precision and technical excellence. Yao, 19, shone particularly on the uneven bars and vault to record a superb total score of 57.900, ahead of Shang on 56.950, with South Korea's Yun Na-Rae third on 55.000. Perfectionist Yao said afterwards she was disappointed with how she performed. "Today I was a little bit nervous. I especially made some mistakes that I shouldn't have had to make. I am sorry that I didn't show my best performance," she said. The focus in the Namdong Gymnasium now turns to the individual events finals which begin on Wednesday.